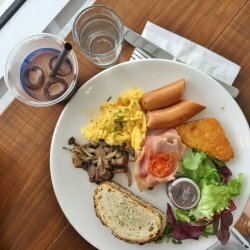 The cafe was located walking distance from Marymount MRT station. For weekday lunch, the place had a light crowd group, consisting of mainly young ones who are having school holidays, and nearby office guys having a cuppa before going back to after lunch. My favourite part was the toast which was buttery and crispy outside, while moist and creamy inside. It was a party in the mouth with the sourness of the juicy fruit and the sweetness of the soft pillowy marshmallows. For a guy, the serving was quite filling and the steak was done up alright. For today, it was Nicaragua coffee bean. Served in a glass on ice, it was a refreshing drink during a hot day. Nice and rich in flavour. One just can't help using the fingers to eat these. So addictive. Crispy and peppery outside, while juicy inside. Overall the food was delicious, accompanied with flavourful drink. The place was cozy and relaxing too. 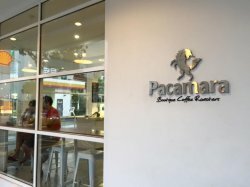 Pacamara Boutique Coffee Roasters is a sleek cafe done in a slate of white - clean cut lines, cheery ambience because of the friendly staff, and provides a great ambience for weekend brunch, afternoon hangouts, chilling out or meals. Their hot white coffee comes in 3 different sizes, SGD$4.50 for 3oz, SGD$5.00 for 5oz and SGD$5.50 for 7oz. 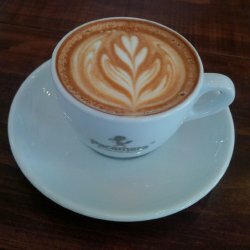 Smooth, aromatic coffee beneath pretty latte art, with a long finish filled with nutty hints - one could see why Pacamara Boutique Coffee Roasters stand out from the many cafes along the same Upper Thomson stretch. 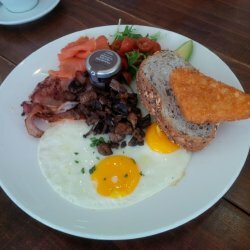 We started with the Breakfast Platter (SGD$22.00) from the Day Menu - consisting of multi-grained toast, fresh avocado, smoked salmon, back bacon, baked mushrooms, potato hash, and choice of eggs. In this case, we had them done sunny-sideup. This large platter was perfect because it comprised of everything under the "breakfast must-have" list, all done to good texture - crispy bacon and hash browns, soft eggs with yielding yolks, umami mushrooms and smoke salmon, buttery avocado etc all paired beautifully with wheat toast for balance. A happy breakfast makes for a happy day, so I guess this must have been a good start for us. Next, Lemongrass Ricotta Hotcakes (SGD$17.50) - triple-stacked fluffy ricotta pancakes infusesd faintly with lemongrass' exotic flavour, topped with zesty berry compote giving it an extra boost of taste and lots of colours. 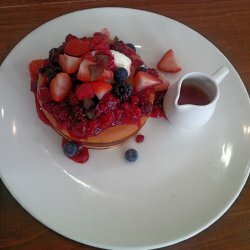 The pancakes were so velvety soft, they melted upon contact with the tongue, becoming a luscious mush with the delicious berries. This scores high points for aesthetics, taste and texture for sure! 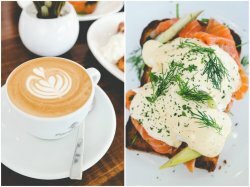 A boutique cafe that's worth the calories! 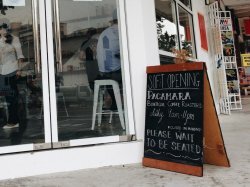 Pacamara Boutique Coffee Roasters has repackaged themselves from previously known as Oz Specialty Coffee and joined the cafe scene along upper thomson road since last year. 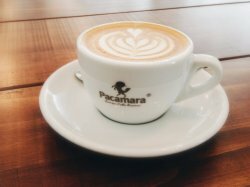 Judging from it’s name, you’ll get to know how much pride they take in their coffee; Pacamara translates to a hybrid strain of Arabica with clean, well defined notes. 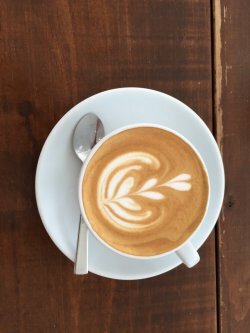 Not just that, once you step into Pacamara, you feel as though you’re surrounded in an angelic clouds of white against the cemented floor and wooden table tops exuding the aura of pureness and serenity. Not only that, a very interesting concept of being roomy yet at the same time encouraging communal dinning. Don’t their tarts and cakes look deliciously good? 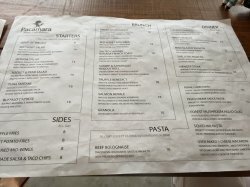 One thing i truly like about Pacamara is their scrumptious list of menu items available for both brunch and night respectively. 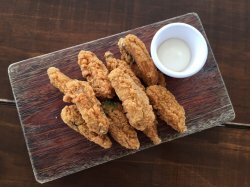 Their day menu will start from 9am to 4pm which consists mainly of salads, brunch items and pastas while their night menu will start from 5pm to 9pm and consists more of finger foods, western mains and once again all time favorites pastas. All prices shown were nett too! Sweet Potato Fries ($8). 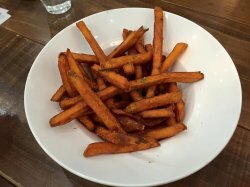 To be honest, it was actually my first time trying sweet potatoes fries. Personally i have not taken sweet potatoes on its own be it being grilled above the charcoal or as a form of sweet dessert soup. These sweet potatoes fries has turn out pretty well for a first timer. 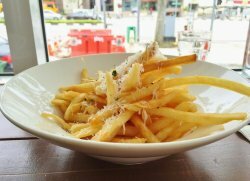 The texture was a little different from the usual fries, more starchy with a sugary element. Oven baked 5 cheese macaroni ($18). 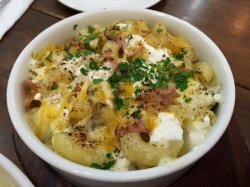 The wanderlust of parmesan, feta, emmental, mild cheddar and mozarella with sparks of truffle oil has has definitely lived up to the anticipation and attention i had for this dish. Long trail of cheese upon pulling a spoonful of macaroni with subtle burst of truffle in your mouth. It’s heavens! Not forgetting the bits and pieces of honey ham and mushroom that has complemented the dish well. Already falling head over heels for this dish, but at the same time wishing for more gooey intense cheesy flavors. Prawn Aglio Olio ($18). Springy spaghetti cooked to al dente. A dish filled with crunchiness from the succulent prawns and green crisp baby asparagus. 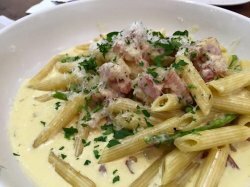 Penne Carbonara ($16). 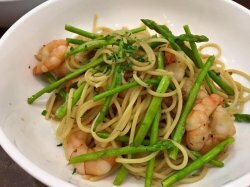 Their cream based pasta is undoubtedly one step ahead of their Aglio Olio. Not too thick and creamy but instead unveiled a luscious sweet light milky note with a touch of cheese and dash of honey ham to create a waltz of balanced flavor which went easy on the palette. A satisfying dinner which makes me can’t wait to be back again to lay my hands on their Truffle Benedict and a cup of aromatic coffee! The place is finally opens 7 days a week. It used to close on Monday but recently it starts to open on Monday. The cafe is not crowded. There is free wifi provided with the password on the receipt. The place is decorated in a bright and simple look with its white colored look. The cashier is quite blur and has difficultly in processing credit card orders. Although JCB, VISA, Master, AMEX are accepted, she could not process JCB (she looks like she has never seen a JCB credit card before), and needs help from another staff to process the VISA order. The iced white is not strong in taste, great for cooling down. 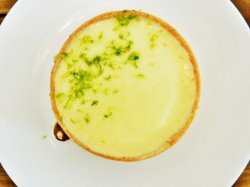 The lemon Yuzu tart is more on the sweet side. Would prefer it to be more tart in tart. Difficult to cut so best eat with fingers holding it. 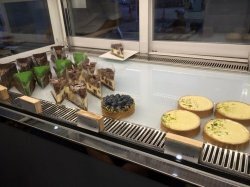 The tart is supplied from Les Patisseries. 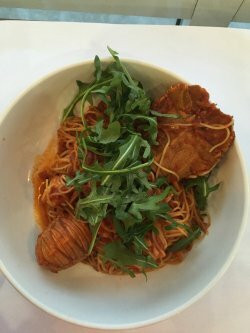 The Moreton bay bug angelhair takes quite awhile to be served. Well cooked pasta dish in tomato base sauce. With roe from the crayfish, it gives the sauce a crunchy texture. Juicy meat from the crayfish. The bitter taste of the green rockets balances the sweetness of the tomato sauce. Overall the food is not bad. Great choice to relax with a cup of coffee. 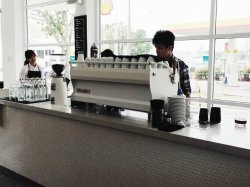 Touted by some as the 'best new cafe of 2014', Pacamara Boutique Coffee Roasters was founded in October 2014, a partnership between the famous Pacamara Coffee brand from Thailand, and Oz Specialty Coffee from Singapore. It's easy to fall in love with the bright, clean ambience, and great coffee and pastries here! Ambience at Pacamara Boutique Coffee Roasters is styled after the Melbourne / Australian cafes, being neat, clean, and bright. Colours of white and wood lend a cozy, clean feel, and the neatly laid out furniture within the spacious, naturally brightly lit interior is welcoming. With minimalist decor and clean lines, Pacamara Boutique Coffee Roasters just makes you want to linger over coffee and pastries with friends. Service at Pacamara Boutique Coffee Roasters is partial self-service, and is possibly the weakest component here. Ordering and payment is done over the counter, but staff will serve orders to your table. Waiting time is rather long, between 10 - 20 minutes, especially during peak periods. The young staff can sometimes be a little blur, such as serving dishes without cutlery, or not bringing enough cutlery. I generally find that I have to help myself to it (not that it's a bad thing). Seating can be rather haphazard, as the long benches are for communal dining, you might end up with strangers opposite / beside you. Food at Pacamara Boutique Coffee Roasters is Western style, primarily British, Australian, and American influences. Brunch dishes feature here, as do their pretty-looking, tasty dessert pastries. 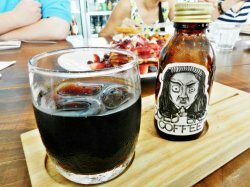 But the focus is truely on serving great coffee, with beans roasted and blended in-house. Portions are large, and may be suitable for sharing. 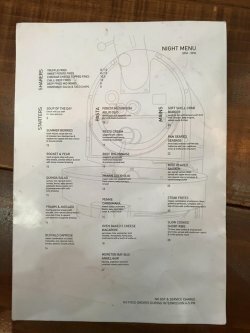 Prices are reflective of a typical cafe, but rather high for main dishes, budget about SGD $28 per person for a meal here. 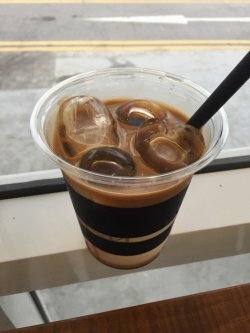 The signature Roadster House Blend Coffee (SGD $5.50) uses coffee beans sourced from Thailand, with a smooth, full, robust flavour that has low acidity and bitterness, with tastes of roasted groundnuts, butterscotch / toffee, and hints of chocolate and caramel. Love it! 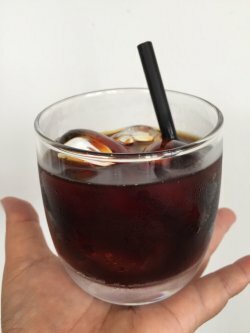 The Cold Brew Honduras Blend Coffee (SGD $6) was pretty good, the chilled beverage has a smooth, sweet, refreshing body with low bitterness, a slight lingering astringent grip, and tastes of melon, chocolate, toast, and roasted nuts. Good enough to drink on its own though, I think pouring it over ice dilutes the natural strength it has. 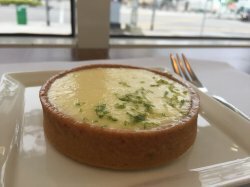 Absolutely loved the Lemon Yuzu Tart (SGD $7), the sweet citrus notes of the yuzu balances the tart sourness of the smooth lemon curd, making it very pleasant to eat! The tart base hold together well, yet crumbles beautifully when cut. Highly recommended! 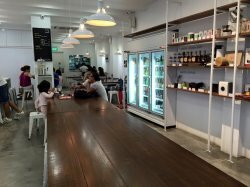 Previously located at Thomson V and known as Oz Specialty, but now revamped and repackaged as Pacamara Boutique Coffee Roasters (Singapore). 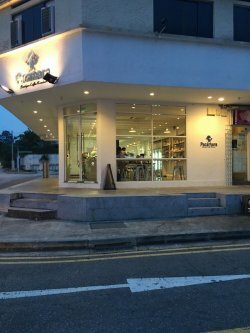 It has also relocated to 185 Upper Thomson Road, next to Shell Station. 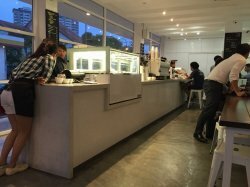 White washed and with a larger dining space, Pacamara Boutique Coffee Roasters now serves proper food besides coffee and desserts. Coffee beans are mainly sourced from El Salvadorean Pacamara Arabica beans and for repositioning purposes, therefore the existing name. Managed to get the window seats preferred over the communal table. The much extended menu now serves Starters (All day unless stated), Brunch (9am-4pm), Dinner (5-9pm), Pasta (All Day), Sides and Beverages. 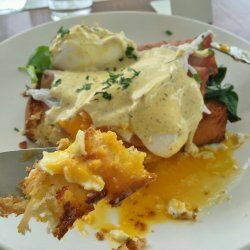 Ordered the beautifully plated Truffle Benedict ($18). Without going into much details, I shall let the picture do the talking. Just to add-on, the Hollandaise Sauce had traces of truffle which boosted my eating experience. Pesto Cream Sauce Pasta ($16). Adorned with a thick and creamy coat of sauce (perfect! ), spaghetti was aldenteand generous cubes of chicken. Overall a delightful plate of pasta. Coffee blend for the day: Roadster, which is there house blend. Cupping notes: Nutty, Chocolate, Butterscotch, Caramel and hint of floral. 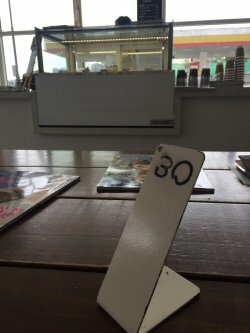 Parking can be an issue, however, it was a good cafe experience except for the pricing which is a little steep. Thumbs up for Salted Caramel Banana French Toast! 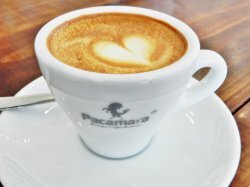 Pacamara is my new love. The team behind Oz Specialty Coffee has partnered with their Thailand partners to bring “Pacamara Boutique Coffee Roasters”. Taking over the corner unit where Liquid Kitchen used to be, the cafe is huge and bright! 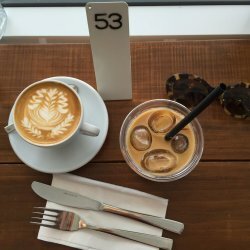 The white Synesso coffee machine, the walls filled with colourful cups, the simple furniture, a long table, everything in nuances of wood and white… Totally reminisces me of my travel in Australia. 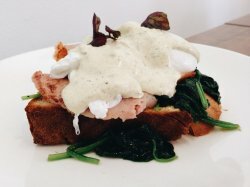 Eggs benedict makes a lovely, lazy weekend brunch or weekday lunch, with the addition of truffle giving it something special. The free range poached egg lies on a bed of smoked ham over brioche and covered in lashings of truffle hollandaise sauce. The truffle hollandaise sauce already seal the deal for me. 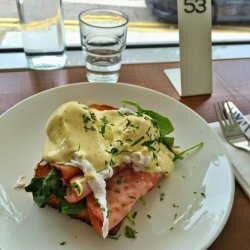 Pairing with my smooth and velvety coffee ($4.50 for 3 oz, $5 for 5oz, $5.50 for 7oz), the Salmon Royale ($18) is another brunch favourite with wiled spinach, asparagus, smoked salmon and anchovies hollandaise sauce. 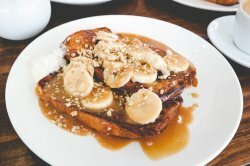 The Salted Caramel Banana French Toast ($16) turned traditional breakfast into a really yummy dessert. Served with caramelized bananas, this is definitely for sweet tooth. 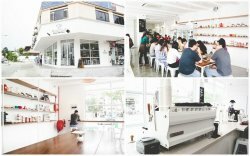 What was formerly OZ Specialty Coffee in another location previously, has become Pacamara. Located now along Upper Thomson, the place is entirely white-washed, save for the furniture pieces. There is a fairly large communal dining bench in the middle, while the rest of the seats are in square tables or raised seating by the window. It may be difficult to come here in large groups, given the seating constraints and its popularity. 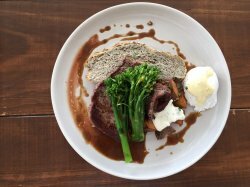 The menu for mains spans just a mere page, but there is a sufficient range of all-day breakfast and pastas. Prices here are on the high side ($16 and above at least) for cafes though. While the beverages were all great, the Iced Thai Coffee stood out for me. There was the presence of a roasted aroma in the aftertaste of a mouthful, which I enjoyed. A balanced drink that wasn't bitter nor too sweet. We got the Truffle Fries to share. The portion was alright and the fries were crisp. However, the truffle flavour and scent was insufficient. It almost felt like having plain fries at some parts. Skip. This dish was highly recommended online, and it did not disappoint at all. The aroma of truffle hits even from a distance. Once cut, the poached egg flowed gloriously to no end. The crispy brioche soaked it all up together with the velvety, flavourful hollandaise sauce. The ham and wilted spinach that acccompanied were fabulous. The ham used was not the cheap cut of deli ham. This was one memorable dish, and one I would order again. On its own, this was filling. While this sounded absolutely mouthwatering, it was underwhelming. There are many better versions of big breakfast elsewhere. Skip. This is superb for those who like a Japanese touch to Eggs Benedict. Again, the hollandaise sauce was done fantastically velvety and full of ebiko flavour. 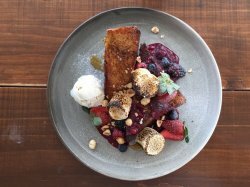 Apart from the Truffle Benedict, this is another dish that is worth trying. 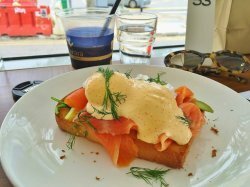 Pacamara does well on its eggs benedicts, and I do hope so for its other mains. The coffees here are more than decent. 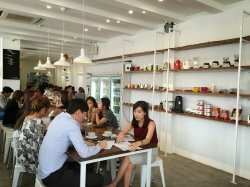 It is a good cafe to turn to, be it for an outing or casual company launch. OZ ... bigger and better! 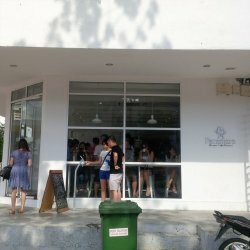 A joint operations between Pacamara Coffee Roasters and the now-defunct OZ Specialty Coffee, Pacamara Boutique Coffee Roasters opened to much hype at Upper Thomson Road roughly a week after OZ Specialty Coffee was closed. 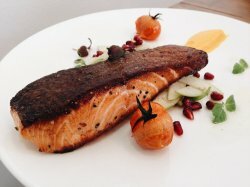 There were three items in the Mains menu; a burger, Chicken Schnitzel and a Miso-Glazed Salmon ($22) even though I had always bore the impression that cafes don’t really execute fish well. How wrong was I; not only the salmon was fresh and flaky, it was also well-seasoned with Miso so it had a nice amount of saltiness. I am glad they had included the Salmon skin in the slab; crisp and smokey it was. Sitting atop an Apple and Fennel salad, it was crunchy and refreshing, along with a fruit puree at the side for a punch. Pretty worth its price. There were a variety of all-day breakfast items available; from pancakes to the full works. We opted for a Truffle Benedict ($18), and it was in fact one of the most memorable Benedict that I ever had. Ridding of the garden salad for wilted spinaches seasoned with a pinch of salt and pepper was a wise choice; the vegetables seemed part of the Benedict rather than a side as it complimented beautifully with the main star. 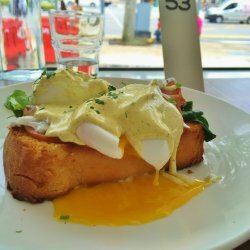 Poached eggs were perfect; soft and runny, topped off with a creamy and slight tangy Hollandaise Sauce. Add the two slabs of thick, quality ham, this was sheer luxury for breakfast. Coffee goes by sizes here. The 5 Oz White ($5) is the balance if you want something creamy yet not wanting to sacrifice on tasting the fruity and nutty notes in the signature Roadster blend. They also do Steampunk mod coffee here; the only other place that serves is Dutch Colony Coffee at Frankel Avenue.